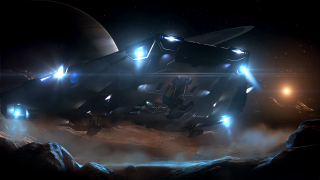 Later this year, landing on planets will finally be possible in Elite: Dangerous. It’s a feature players have been dreaming of since the game was first revealed, and will bring the game’s three pillars—trading, combat, and exploration—to the surfaces of procedurally generated alien worlds. I talked to director David Braben about what Frontier has in store for Horizons, a paid-for ‘premium’ update to Frontier’s superb space sandbox. “From a design point of view, this has been in the works from the start,” says Braben. “But recently, work on it has gradually ramped up. We’re starting with airless planets and moons to begin with, but Earth-like planets will happen in the future.” Like the galaxy itself, the surfaces of these planets will be created using procedural generation. But that doesn’t mean they’ll be random scatterings of rocks and ice: Frontier’s algorithm uses real science to generate its extraterrestrial landscapes. Horizons is what Frontier are calling a ‘season’ of updates for Elite: Dangerous. It will cost £40, or £30 for existing players. But they’re keen to stress that support for players who don’t upgrade will continue, and owners of both versions of the game will still share the same connected galaxy—and be able to fly together in the same wings. I’m one of about a dozen people who loved the Mako exploration in Mass Effect, so I’m pretty excited about Horizons. Braben talked at length about how realistic their procedural generation model is, and how it predicted with near-accuracy what Pluto was like before NASA’s New Horizons probe reported its findings last month. The idea of exploring these planets that are rooted in reality sounds intriguing. However, I can see the high cost of the expansion being divisive, no matter how much content it offers. The official release date for Horizons is ‘this holiday’, so November or December seems likely.